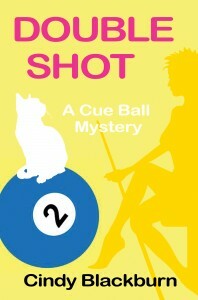 Cindy Blackburn is the author of the Cue Ball Mysteries. 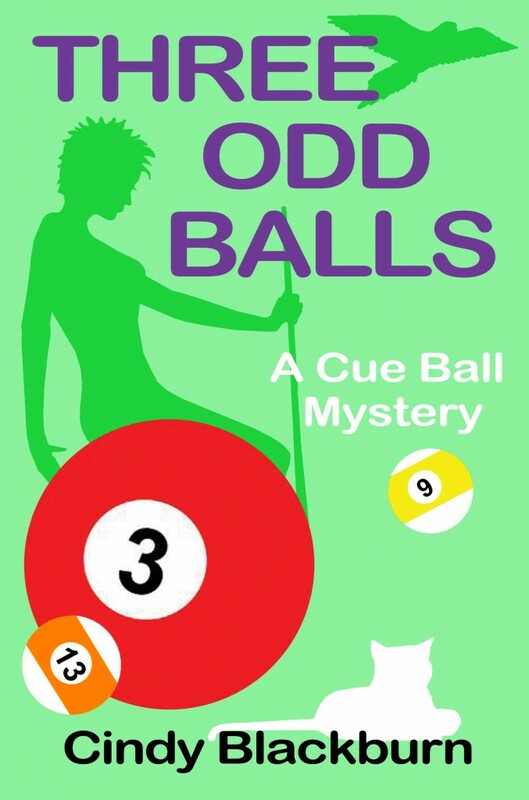 There are currently three books in the series: Playing with Poison, Double Shot and Three Odd Balls. Pool shark Jessie Hewitt usually knows where the balls will fall and how the game will end. But when a body lands on her couch, and the cute cop in her kitchen accuses her of murder, even Jessie isn't sure what will happen next. Playing With Poison is a cozy mystery with a lot of humor, a little romance, and far too much champagne. Cindy Blackburn has a confession to make–she does not play pool. It’s that whole eye-hand coordination thing. What Cindy does do well is school. So when she’s not writing silly stories she’s teaching serious history. European history is her favorite subject, and the ancient stuff is best of all. The deader the better! A native Vermonter who hates cold weather, Cindy divides her time between the south and the north. During the school year you’ll find her in South Carolina, but come summer she’ll be on the porch of her lakeside shack in Vermont. Cindy has a fat cat named Betty and a cute husband named John. Betty the muse meows constantly while Cindy tries to type. John provides the technical support. Both are extremely lovable. When Cindy isn’t writing, grading papers, or feeding the cat, she likes to take long walks or paddle her kayak around the lake. Her favorite travel destinations are all in Europe, her favorite TV show is NCIS, her favorite movie is Moonstruck, her favorite color is orange, and her favorite authors (if she must choose) are Joan Hess and Spencer Quinn. Cindy dislikes vacuuming, traffic, and lima beans. I don’t know about everyone else, but I ALWAYS want to know more about authors. You know what do they do when they aren’t writing, what do they like to eat, what their writing journey has been like, etc, etc. 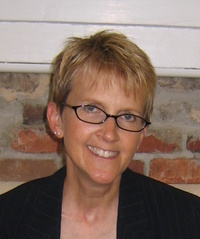 Bella at Cozy Mystery Book Reviews set me up with Cindy Blackburn, in order for Cindy to do a guest post here on the blog. Read on to hear Cindy’s funny explanation to a topic I chose for her. I had to laugh when Kim asked me to write a blog about my writing journey. She mentioned that this journey “appears to have taken a while,” and she wondered if I might care to explain why. I have hundreds of reasons, rationalizations, and excuses for the delay. Some of these are on the practical side, and some would likely require years and years of therapy to sort out. But as my family keeps reminding me, I am getting old. So let’s skip the decades of deep counseling sessions and cut to the number one practical issue that held me back from actually completing my first novel: I was dragged kicking and screaming into the word-processing era. Credit my hubby for the dragging. It took the poor guy years (okay, decades) to convince me not to write long-hand, but to—are you ready for it?—USE A COMPUTER! I cannot count the number of times he shook his head in dismay at my ever-growing stack of legal pads, on which I was continuously writing to no purpose whatsoever. Each sheet of paper on each legal pad was chock full of this detailed tidbit of a story, or that intricate point of a plot, or this short snippet of inspired dialogue, or that vague idea for a new story altogether. I would fill each legal pad to the brim, toss it haphazardly into a banker’s box, and pick up the next empty tablet. No one knew. And while I worked myself into a tizzy of anger and hopelessness my techno-whiz husband would stand in the doorway to our office, quietly and calmly (the man can be absolutely infuriating) suggesting how much easier life could be, how much happier I could be, if only I would take him up on his offer and begin to use a laptop. I refused. And I refused. And I refused. Until the fateful day when hubby took matters into his own hands and bought me my very own laptop, whether I wanted it or not. “Surprise!” he said. “Why don’t you use this to write a book!” he suggested. He found his biggest, happiest smile and stood before me, holding out the brand new laptop. It might been five minutes—it certainly was a very pregnant two or three—until I sighed dramatically and reached out. And I’ve never looked back. Because, here’s the deal—computers are great for writing! Who knew? For instance, they have these keys called Backspace and Delete. They make revising a dream, I tell you! The Backspace key is my friend! I love you, Delete key! And don’t even get me started on the “Save” and “Save As” features and functions for filing and organizing. Handy-dandy! Oh, and if you’re wondering about the fate of all those legal pads? They still exist in the back of the office closet, where they will no doubt languish until my death. And hubby? I dedicated my first book to him, and he’s acknowledged in all the rest. Sooooo, does anyone else resist change? Or am I the world’s only fuddy-duddy? How about technology? Scary stuff for anyone other than moi? 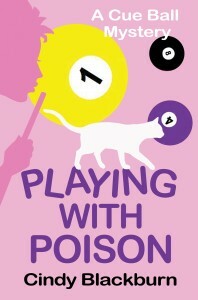 Cindy will be giving away one ebook copy of Playing with Poison at each blog stop. Comment below by answering Cindy's question for a chance to win. Be sure to enter your email address, so you can be contacted, if you are chosen the winner. The contest ends on Sunday, February 10th. The winner will be chosen on February 11th. Good luck. I'm a bit of a luddite too. I have a very basic cellphone which I only have for emergency use and the only thing I know how to do on it is make calls. I use a computer at work and have one at home that I don't have internet for. I have antenna tv with just a dvd player. This works for me probably because I don't have kids. I had to replace my cell phone recently since the old became obsolete. And we have just gotten a flat-screened TV. But when we tried to get rid of the old TV, no one would take it. Not Goodwill, nor Habitat for Humanity. Alas--it was too old and outdated! I'm old, too, Cindy! I've self-pubbed some books and completed a couple of mystery novels but so far they are not published. I wrote myriad notes in longhand and typed my first (bad) stories on typewriters. But - I fell in love with computers when they first became available to civilians. I'm on my second laptop and can't even remember how many desktop PCs I've had. Only finances keeps me from buying every new tablet that comes out to see which is best! Guess it's inheritable, my daughter, grandson and his wife (their two and a half-year old son shows signs!) are so into computers, too. I have a basic Kindle and I only make and take phone calls on my cell phone. It is not learning all the new stuff it is paying for all of it. I cannot afford it so will be in the dark of technological changes as I can hold off (when they stop making basic stuff).Sometimes, I think the companies think their gadgets are easy for everyone to afford! I didn't mention it in my blog, Sylvia, but I'm on my 3rd laptop! Luckily hubby the techno-geek sets things up for me each time I need to replace it. My favorite was a little pink jobbie. It was a sad day when it went kaput. And I agree, Carol--it is expensive! We don't have a land line phone anymore either. Yikes Cindy! I'm older than you so I don't know what folks will say if I ever get my books out there. Great blog. You are so funny and it shows in all three of your books. I hope you are working on number four! Missed you in Charleston last month. Kim here, the thirty something year old who feels like she insulted you. If I did, I'm SO sorry.... I honestly don't know where I got the idea that your writing journey was been long. Honestly I've slept a lot since I asked the question. But if I haven't already wanted to read your books, your guest post had me laughing. Thus, I'm looking forward to laughing while reading your books. THANK YOU so much for stopping by today and doing a Guest Post for me. Technology.... Oh my gosh!!!! My husband, Tech Geek, is ALL into the latest tech junk. I got a smart phone and was ALL upset about it. He didn't give me a choice. Now, It's my life line, so to speak. He bought me my first Nook and I didn't understand why he insisted that I have one. Then he bought me a Kindle Fire. Again I was upset about it. I LOVE B&N. Now..... I don't leave the house without my Fire. I lost it for two hours one day and the WHOLE world STOPPED! Sylvia, my two year old, actually almost three year old has a tablet. She got it back in Octboer and completely knows how to do everything on it. She actually taught herself how to play a game in a week. Not insulted at all, Kim. Please don't lose any sleep!! Hey Jan!! Yep, I'm working on #4, Four Play, and hope to have it available in the fall. Okay, now back to writing. I agree; if it works, why change it? All I can say is I'm glad you finally listened to your husband, because I thoroughly enjoy your books. As far as being a fuddy duddy, count me in. I've only learned to do techy things out of necessity. Very entertaining post! I'm always afraid to trying new technology---I still haven't figured out all the stuff on my iphone or kindle--but I try to stay somewhat updated. LOL I must admit, I write everything long hand, then type it on the computer later. And yes, I sometimes lose all those fantastic things I've written!